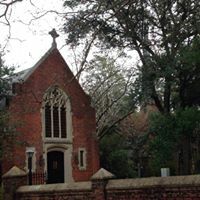 Calvary Episcopal Church was built during the ministry of the Reverend Joseph Blount Cheshire in the stormy years between 1859-1868. The architect, William Percival, originally proposed that the exterior of the building be of stucco over brick and that the towers be of wood. In the final plan the brick exterior was left bare, brick was used in the towers, buttresses were added, and the church was lengthened by one bay. A search for earlier Episcopal endeavor in Edgecombe County would yield little. 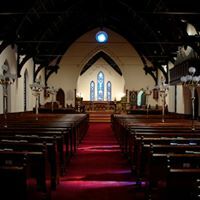 The original Church of England parish in the County, St. Mary’s, was located eight miles northeast of Tarboro and was fairly large considering the small size of the community. The parish church was finished about 1749. Today not a trace remains of St. Mary’s. Its register was burned as wastepaper and the congregation was attracted to a new wooden church in the newly incorporated Town of Tarboro. This new church (c. 1760) is thought to have been built on land now belonging to Howard Memorial Presbyterian Church.